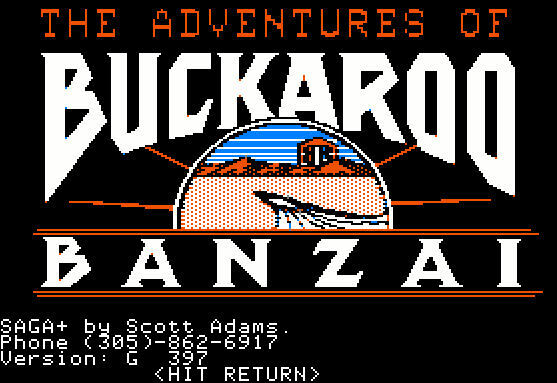 The Great Scott Project is working through the remaining Scott Adams games, and we have arrived at the last of the original series: The Adventures of Buckaroo Banzai, based on the 1984 MGM/UA movie The Adventures of Buckaroo Banzai Across the 8th Dimension. MGM's potential-blockbuster licensing was oddly fragmented in the mid-1980's, with the official Poltergeist game landing at Radio Shack, a couple of 2010 games produced by Coleco, and this one adapted by Adventure International. Unofficially, this game has been referred to as Adventure #14B, though contentwise it's no relation to #14A. This licensed game was a one-off with no specific series identified; many sources just call it Buckaroo Banzai for short. It's credited to Scott Adams, of course, and a co-author, Phillip Case. 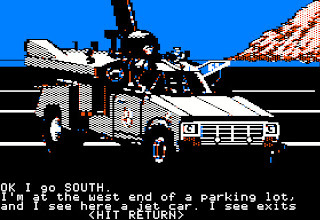 Like the later QuestProbe games, The Adventures of Buckaroo Banzai was released in both "classic" and "S.A.G.A.+" versions, as Adams' updated interpreter was not available for some older platforms. 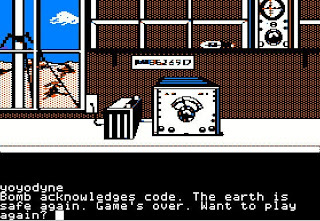 The two versions are very similar, with additional descriptive detail and extended puzzles in the "plus" version, and the game featured graphics by Kem McNair on several platforms. I intended to play this one using the ScottFree interpreter, but after I had worked out most of the game, I discovered that neither the Windows nor the DOS version would allow me to use the DISCONNECT verb as intended. So I fired up the Apple II version, which turned out to be in SAGA+ and threw a new puzzle at me almost immediately, invalidating some of what I'd been figuring out. So I ultimately played through this one using the UK Sinclair Spectrum version, and then took a quick tour through the Apple II version to gather some screenshots. 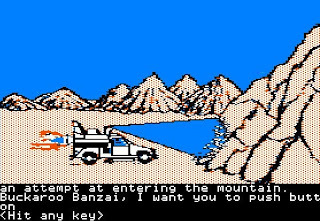 There aren't many differences, really; the most visible one is the character-based prompt, reading Buckaroo Banzai, I want you to, as seen in the SAGA+ QuestProbe games. 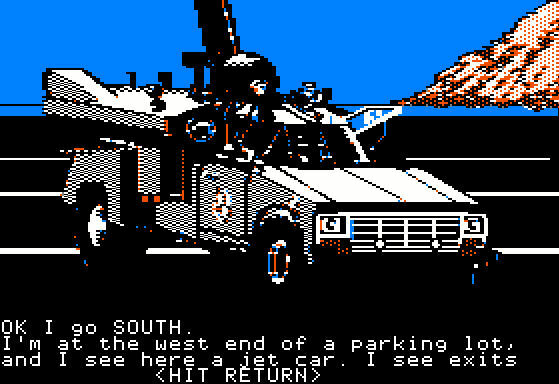 The Buckaroo Banzai game doesn't attempt to cover the scope of the movie. Instead, it's a prequel of sorts, with a plot that precedes and overlaps the movie's opening sequence -- we have to get Buckaroo Banzai's incredible Jet Car up and running, then stop an atomic bomb from destroying the world. We start out in the Yoyodyne offices. MOVE TABLE (in the classic interpreter) reveals a Floor Safe. EXAMINE SAFE yields I see it's a key safe, so we have to track down the key. The SAGA+ edition includes another puzzle here -- MOVE TABLE results in Sorry, it's too heavy! But the bomb-disarming passwords are the same as in the classic version, so we don't actually have to solve this part of the game if we've played the other edition. There's also a staircase in this room, but it's wise not to go down until we've obtained a light source. GO STAIRS takes us down into the darkness, but trying to go UP from the dark basement causes the traditional neck-breaking fall (another GO STAIRS works, but it's hard to figure that out without the flashlight in hand.) A technical aside -- the Spectrum version has no illustrations, but the dark rooms still display a solid black block in the graphics area of the screen. Outside the office we find ourselves in a small town at the foot of a mountain, with a gas station across the way and just a couple of major streets to explore. This setting doesn't have much to do with the movie, but it's nice to have an outdoor environment for a change, though it's strangely unpopulated. The SAGA+ version makes it clearer that the town has been abandoned by a panicking citizenry, presumably due to the atomic bomb set to go off if we're not quick about solving the puzzles ahead. There's a large house in the cul-de-sac at the east end of Hickory -- we can only enter and explore the garage, where a small toolbox bears a sticker reading Sam's Service Station. With a simple OPEN TOOLBOX we obtain several useful items -- a key, a roll of duct tape, and a flashlight. The puzzles in this adventure are fairly logical and straightforward -- no magic words or odd usages are involved, though we do have to be creative with the tools we're given. The west end of Hickory ends in another cul-de-sac -- the classic version has a house with a living room containing nothing of interest, while the SAGA+ version has an empty lot, and tells us that there were probably plans to build houses here at a later date. We can ENTER CAR and EXAMINE DASHBOARD to discover a starter button, a glove compartment, and a fuel gauge on empty. The glove compartment contains a fuel formula and a glowing jar of green fluid. The formula reads Fuel is made from gasoline, sand, quartz, catalyst; we can correctly presume that the mysterious glowing fluid is the catalyst. (The SAGA+ version replaces the quartz with Bauxite crystal.) So the first major puzzle is set forth -- we have to mix up some jet fuel before the car's going to do anything. Time to GET OUT of the car; EXIT doesn't work. To the north is a lifeguard shack on the beach, containing a small ham radio that will be involved in the game's primary non-fuel-related puzzle. It has a transmit switch, but no battery and no antenna, so it's not working. We have to take it to a shed on west Hickory, where an immovable antenna lead exists. Arranging a power source will take a bit more work. The beach abuts a cold, shallow mountain lake - we can SWIM while standing in it, but that never does anything or takes us anywhere, and we can't HOLD BREATH in this adventure -- so the only useful thing here is the water itself. The mountain nearby is more intriguing -- EXAMINE MOUNTAIN at the foot yields I see a ledge about 15' up with a small peak. Precise measurements are always suspicious, so we'll be on the lookout for something measuring fifteen feet or longer. We can only carry five inventory items at a time, although temporary overloading is allowed when an action discovers or produces new items that are automatically carried. So there's some juggling required as the game progresses, and we need to be efficient, given the time pressure presented by the bomb. The hardware store on Main Street has a number of useful items - a climber's pick (described more helpfully as a pick ax in the SAGA+ build), hydrometer (for testing car batteries), manual hand pump, and jumper cables. The gas station has gas pumps, a cashier's booth, and a padlocked filler pipe connected to the underground gas tank, which we can unlock with the key found in Sam's toolbox. The cashier's booth is cluttered with a trash pile, containing an old, empty car battery, and a control console with a switch for the gas pumps, which proves useless. So we have a fuel source, but no ready way to get at the fuel. With Sam's flashlight, we can return to Yoyodyne and see the basement laboratory and its mixing vat, presumably handy for making jet fuel once we've gathered the requisite ingredients. I had to consult the CASA walkthrough to find a container for the gasoline -- EXAMINE STAIRS in the basement lab does the trick. The floor safe in the Yoyodyne office can't be opened with the service station key, so that remains a puzzle for the moment. It's always worth trying to DIG anywhere and everywhere in these games, and Buckaroo Banzai hints at a solution by responding Not with these hands when we try to do so without the proper equipment. With the climber's pick in hand (oddly, it's not at all useful for climbing the mountain!) we can DIG a hole in the field of tall grass near the freeway to find an underground phone line. It's best not to venture onto the freeway, as once we've gone up the exit ramp we cannot leave the open pavement, and we can only walk east or west for a few turns before An atomic explosion erupts. I'm fried Banzai. So that's not a productive area to explore. We can FILL BATTERY in the cool, shallow lake, and CONNECT BATTERY to the ham radio, though that doesn't do much good until we can charge it up. We can remove the fuel hose from the Jet Car and carry it to the gas station, and in the ScottFree interpreter I ran into something weird here. I believe I tried to CONNECT HOSE at the gas station -- it didn't appear to work, and the hose wasn't connected to the distant car, but the car fuel gauge changed to read full. Trying to START CAR, however, caused it to blow up, so apparently it was filled with regular gasoline, not the required jet fuel. I ultimately restored and tried again after confirming that I was on the wrong track. We can use the manual hand pump to help out here, but it took me some time (and the walkthrough) to get everything worked out. I discovered that we can't CONNECT PUMP / TO PIPE at the gas station. At the Jet Car we can CONNECT CABLES / TO BATTERY and TO TERMINALS, though in the classic version we can't really tell if it's actually connected; the SAGA+ display is clearer on the details. The hydrometer can be used to TEST BATTERY; it initially tests as Dead. CHARGE BATTERY is recognized by the parser, but the correct approach requires more specific actions. To get the quartz/Bauxite, we actually have to DIG twice in the field to make Another large hole. I couldn't quite tell at first why this is allowed -- GET LINE yields I can't, it's still attached, even after CUT LINE says I see the line is severed. With the walkthrough I was able to figure out that we have to cut the line in two spots to free up a section, which is why we are allowed to dig two holes. CUT LINE requires the climber's pick, which isn't generally a problem as we're using it to dig the holes. The whole process yields a suspiciously precise 20 feet of phone line. Now we can go to the foot of the mountain and THROW LINE, which catches and dangles down from the ledge fifteen feet above. The quartz is accessible from the ledge, but we need a tool to free it from the mountainside, and we can't climb while carrying anything. So we have to TIE LINE / TO PICK, CLIMB LINE, then PULL LINE to retrieve the pick, which now allows us to GET QUARTZ. EXAMINE HOSE indicates that the fuel hose is clean, which isn't significant at this point, but its condition will be important later on. The manual hand pump has a hose 6 feet long, which is not enough to reach the fuel in the gas station's underground tank, but we can duct tape the car's fuel hose to the pump to make a combined hose 10 feet long. Now we can INSERT HOSE (yielding It does reach the gasoline) and PUMP GAS if we have a suitable container. At last we're able to MIX FUEL in the basement vat at Yoyodyne, yielding a Jug of jet fuel. The modern ScottFree interpreter caused me no end of problems at this point -- I could not get it to allow me to DISCONNECT HOSE, so I couldn't finish the steps required to get the car going. And when I refueled the vehicle (after the odd CONNECT HOSE bug occurred earlier) the fuel gauge in car now read full full, probably because the game's internal state had both gasoline and jet fuel in the tank simultaneously. I didn't run into any of these issues while playing the Spectrum and Apple II versions. With a tank full of jet fuel, we can start the car (unless we forgot to clean and replace the fuel hose, in which case the car either blows up or doesn't work at all.) It's important to take a moment here to charge the car battery using the jumper cables -- the car doesn't need it, but we need it for another purpose. If it's connected while the car is idling, it will go from Dead to Weak, enough to run the radio later. The car fuel gauge remains on full while it's idling -- only driving from place to place seems to use up fuel. Once we're inside the mountain (using the Jet Car's remarkable matter transparency capabilities) we'd better still have the flashlight, with which we can discover the bomb. EXAMINE BOMB indicates that it has an RFI (radio frequency interference) shield, currently turned on, and a switch. There's also an envelope nearby, which contains the key for the floor safe at Yoyodyne. 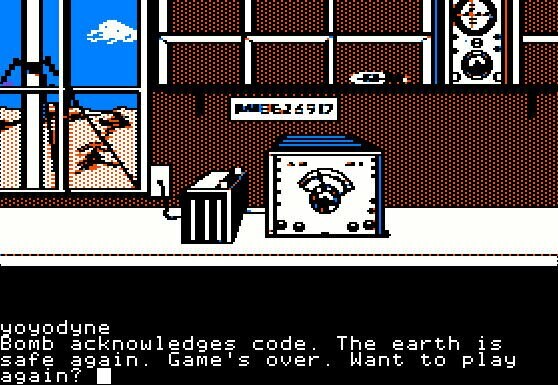 We need to turn off the bomb's RFI shield -- how anyone would know this before exiting the mountain and failing to stop the radio from detonating using the radio is beyond me, so chalk this action up to the traditional "It's an adventure game, so any unpressed switch should be pressed at least once" rule. We escape the mountain by simply walking north and exiting through a handy door, at least in the classic interpreter version. The SAGA+ edition has extra locations inside the mountain, a tunnel and a duct-like maze that presumably contains something to help us move the heavy table. I never did actually solve this in my playthrough, as the flashlight I carelessly left on for too long earlier kept running out of juice before I could explore the area thoroughly. But as it turns out, the same bomb-disarming code words found in the classic version are also valid in the SAGA+ version, and the game does not require that we actually find and read the paper to win. So I was able to finish this run using the a priori knowledge from my Spectrum run. This is a bit odd -- Warfin is spelled differently from the name of John Lithgow's movie character, Lord John Whorfin (alias Dr. Emilio Lizardo). This is an odd mistake to make, because the character actually spells out his name letter by letter during a phone conversation in the movie! But back in the day the designers may have had to work from a raw script without later additions and on-set revisions, and in any case we have to abide by the game's spelling to satisfy the parser. Once we get back to the radio shed and connect the battery to the ham radio, we hear a doomsday countdown. In both of my walkthrough-assisted attempts, we had plenty of time left until detonation, more than 400 moves, so there wasn't a lot of pressure at this point. Of course, we can't hear this status update and breathe any tentative sighs of relief until we have the radio hooked up, and if we left an item behind or forgot to do anything important inside the mountain, we're stuck at this point. Since we have the opportunity to compare, let me record a few random observations about the SAGA+ interpreter as compared to the classic Scott Adams engine. LIGHT and UNLIGHT are replaced by TURN ON / TURN OFF, and DROP MANUAL PUMP at the gas station seems to ignore the adjective and still prompts for disambiguation regarding gas pump versus manual hand pump. I also found the Apple II version a bit frustrating just because it plays more slowly due to graphics loading time, but that's just because I've recently been spoiled by the lower-quality but faster-loading graphics of the IBM PC QuestProbe games. I suspect the classic interpreter build was cut down from a primary design intended for SAGA+ -- the SAGA+ text is more elaborate, and the MOVE TABLE and mountain duct maze puzzles bookend the whole story, making it seem like those were cut for space in the classic version. Also, one oddity is that in SAGA+, GO STATION works the same as ENTER STATION, but GO YOYODYNE puts us "at" the Yoyodyne building instead of taking us inside from outside. Next time, we'll take a look at Scott Adams' post-Adventure International return to the genre and a favorite adventuring environment, with his independent shareware release, 2000's Return to Pirate's Isle 2. Interestingly enough this game was mostly written by Phil and Kem. We had a pre release of the movie on VHS tape that we all got to watch and fairly short time line to get the game out the door. I was busy with some other project at the time (Marvel perhaps?) and just did some of the editing. I think I also did some idea sessions with them too. So its about 80% their work and only 20% mine as best I remember.